The clock is ticking. Midnight is approaching. A new year is about to dawn. Pressure. I’m already feeling pressure. I haven’t composed a list of resolutions or reflected on the past year while looking forward to the new one. We are just back from 10 wonderful days in Montana for Christmas with my sister’s family. I am thankful for a flexible job that allows me to pick up and miss so much time any time I ask, even nearly last minute! I rushed home from our trip, though, anxious to catch up at work, catch up at home, and catch up on life. Catching up. I’m already playing catch up as the new year begins. I feel the need to slow down and breathe. To take a moment to sit and be still, to know that He is God (Psalm 46:10). He holds all things in His sovereign care, in His powerful arms, and I can simply rest. Rest. Do you also need that already, before the new year even begins? His yoke is easy, His burden is light (Matt. 11:28-30). Bring your cares before Him, casting all your anxieties upon Him, for He cares for you (1 Peter 5:7). It’s not too late! There are two hours left before the clock strikes midnight. I’m going to pause, grab my Bible, journal a little bit, reflect on my word for the new year (that I do have, as I like to have a theme for each year), be still, remember what God has done the past year, look forward to what lies ahead, and pray. Pray. I today remembered a couple who invited us over to their home several years back to bring in the year with prayer. We didn’t know any of the other couples there, but it was really a sweet time. What a great thing to do to pray in the new year! In our coming year, one child is wrapping up high school and thinking about college. The other is learning to drive. My husband is writing new books, and I am involved with several events and projects at church. Why not take time to pray for these forthcoming new things, the things set before us, to commit our ways to the Lord and trust in Him to act (Psalm 37:5), to pray for His will to be done in our lives, families, friendships, schools, and workplaces. After 10 adventurous days away, we didn’t have much planned on our New Year’s Eve calendar. And the night is turning out just right. How is your 2016 ending? I wish you a happy New Year as we welcome 2017. For the coming year, our church is encouraging us to all read the entire Bible together. They have provided a wonderful resource to guide us through it, based on the Discipleship Journal’s plan. This past year, I started again to read the whole Bible in a year, taking a different approach than chronological. This time I read four different parts of the Bible each day, using the M’Cheyne Bible reading plan, and reading For the Love of God by D.A. Carson, daily devotions to accompany that plan. I invited a friend to do the same. It was absolutely one of the most beautiful studies of the Bible I had ever done. I was fascinated with seeing the big picture of the Bible, the ways things from the Old Testament were tying into the New Testament. It gave me a place to go each morning when otherwise I would have wondered where to read. Sometime during the year, though, I started a Bible study and stopped my daily reading plan, thinking I couldn’t do both. I have missed it. And I had long forgotten starting the year reading my Bible with my friend and talking about that with her — until I got an email from my friend this morning. She told me she had just finished reading her Bible all the way through for the first time, thanking me for that encouragement to do this. It surprised me. I hadn’t thought about it in months. She is reaping the reward of that diligent reading of God’s Word that I missed. And it struck me that with a little encouragement and support, this is something we can all do together. I’m looking forward to reading the Bible this year with my church and invite you to join me in this, too! The new year. A time to begin again. New hopes, new goals, new plans. Yesterday, I turned the last page and closed the book it took me a year to read. The Bible. 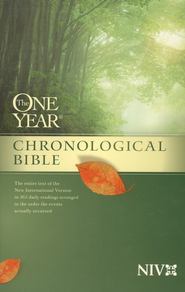 I used the NIV One Year Chronological Bible. It was the first time I had ever read the Bible in a year, the completion of a goal I set for 2013. It was a blessing to see the full scope of God’s Word, how it all ties together. I encourage anyone to do this and take time to see what God has spoken to us through the Bible. 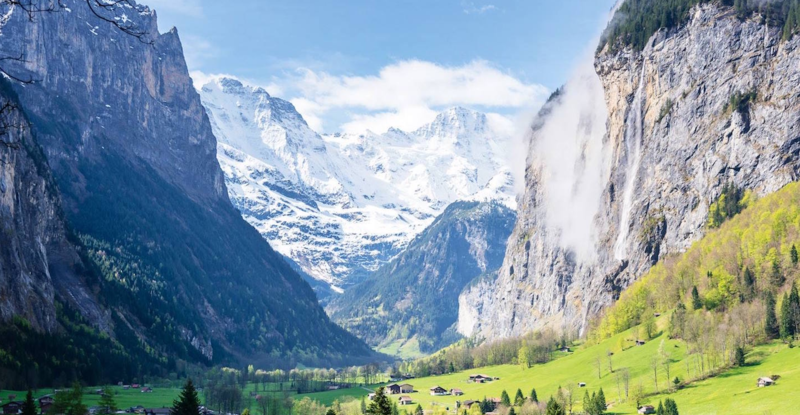 For those of us craving to hear from God, this is the place we find Him speaking. It’s worth the time to daily read, reflect, and pray. I could come up with a whole list of goals and resolutions for 2014 (i.e., exercise, eat right, limit distractions such as social media, etc.). Perhaps like last year, though, I should pick one main thing and find joy at year’s end when it’s achieved. Instead of many resolutions that end up broken, I name one that is attainable and that can produce growth through that one action. And then commit it to the Lord, asking for His strength to do it, dedicating the new year to Him. It’s been a while since I blogged. We were busy the last couple of months of 2012. My sister and her family came to visit us for two weeks for Thanksgiving. I had not seen them for almost 2 1/2 years — and that visit was for my step-father’s funeral and was a short time together. 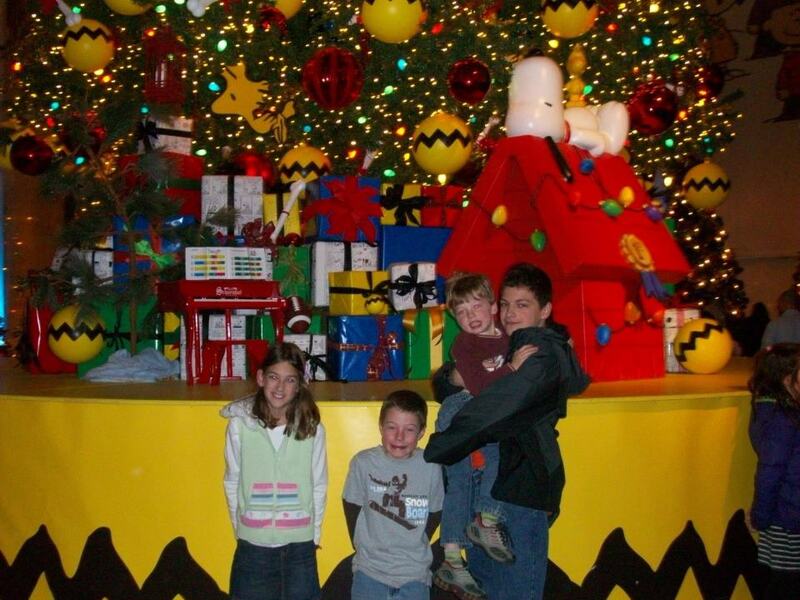 We toured many museums and had so much fun watching the cousins together. Christmas was wonderful. I often feel overwhelmed at Christmas with all that has to be done, but this year seemed very smooth and was so much fun. We entertained a few times in December, having students out twice, having our small group over, and hosting friends two or three times for dinner. One dinner party was unexpected and planned on short notice, but those seem always to be the easiest and best kind. My husband’s family were all out of town this Christmas, so we enjoyed a quieter one with my mom. I’m so glad she moved here this year and is getting to spend a few weeks with us while the family that has rented the house to her are back in town for their Christmas vacation. It’s been great! So now we enter a new year. I don’t like to leave the last year without some kinds of reflections and enter the new one without having a theme. I never did update after I took the 10 day prayer challenge in October about how my heart was being deceived. At first, I anticipated a specific answer each day, but there were 2 specific answers during that time. One was the blog post I wrote about bridling my tongue. That has continued to come to mind more times than I can count when I am in conversation. It has been an important truth for me to remember and an area where I can continue to grow. There were specific ways this was applicable to me at that time. Isn’t this such the reverse of what we would naturally desire? Self-denial, carrying a cross, losing our lives? But it’s in embracing those things as we follow Jesus that we really discover our lives and true joy! My heart can deceive me in these kinds of things. So those were some meaningful verses for me in 2012. A favorite song was 10,000 Reasons by Matt Redman. The third and last verse will always remind me of our friend who went to be with the Lord in 2012. Some Bible studies I enjoyed in 2012 were Beth Moore’s study of James, Beth Moore’s study of Esther that I did on my own and finally finished last night!, and the Bible studies we did at church on the minor prophets (spring) and the Storyline of the Bible (fall). This is when it’s fun to keep a blog and scroll through some of the events from the last year and remember different things, from speaking at Women’s Bible Study in the spring, to the third book in my husband’s trilogy being released this summer, to knee surgery in the fall, to seeing our friend go to be with the Lord. It’s good to trace the journey of life through these seasons and record God’s hand at work in each of them. I’m very excited and enjoyed the first day today! We’ll see how it goes! Happy New Year to whoever stumbles upon this blog! May you be blessed in the new year and know the joy of following Jesus daily.